Google on Wednesday released an official app for its Adsense advertising network. 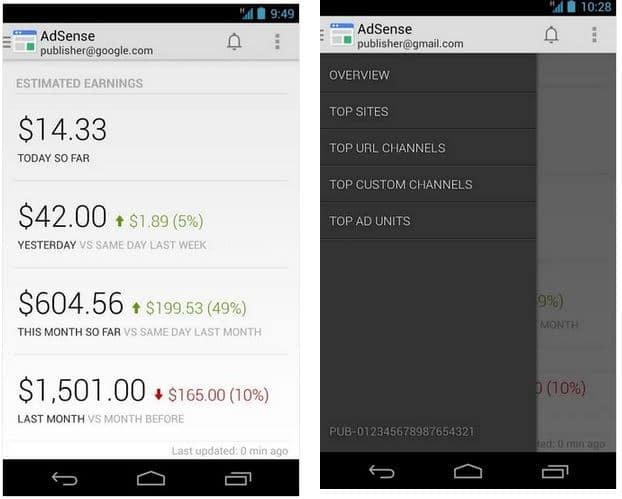 The Adsense app was released on Google Play for Android devices. This Adsense app allow website owners using the Adsense program to check their data and information from their Adsense account. Website owners can see earnings for today, yesterday, this month, and last month within the app. The Adsense app also allows you to check your top earning sites, top URL channels, top custom channels, and top ad units. The Google AdSense app provides an easy way to access key data from your AdSense account. Access reporting features anywhere, directly from your mobile phone. The first version of the app gives you access to: the key earnings information, top custom and URL channels, ad units and sites reports, payment alerts. If you’re a website owner and wish to download the official Adsense app for your Android cell phone, you can download it from Google Play for free. The app, however, is not compatible with all Android devices.